The Adaptive Tactical EX Performance Stock has been added to Big Horn Armory’s AR500 Rifle. 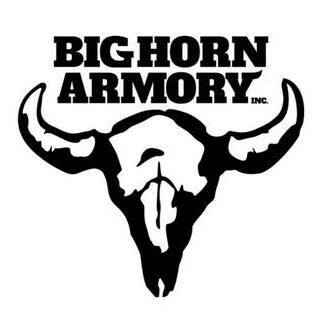 Nampa, Idaho (May 2018) – Adaptive Tactical, LLC, manufacturers of innovative firearm stocks and accessories,is proud to announce a partnership with Big Horn Armory. Adaptive Tactical has been selected as Big Horn Armory’s OEM EX Performance stock provider of choice for theirAR500 semi-auto rifle. 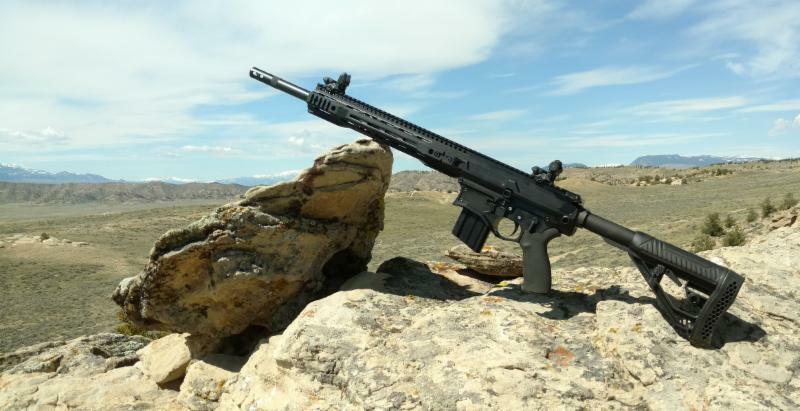 The AR500 semi-auto rifle is a specialty high-end rifle built by Big Horn Armory in Wyoming. It is chambered in 500 auto max cartridge and is the most powerful short range semi-auto in the world. Based on an AR308 platform, the AR500 is capable of putting 50 BMG power on target with three trigger pulls with very reliable extraction. “Adaptive Tactical’s EX Performance stock was chosen for Big Horn Armory’s AR500 rifle because it offers an estimated 30 percent felt recoil reduction over the nearest competitor. 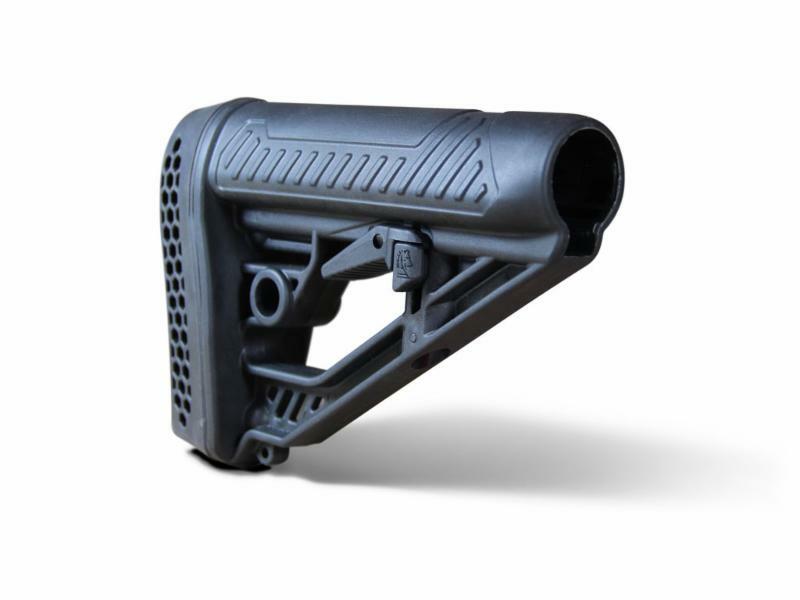 It is an extremely well made and durable buttstock that is perfectly suited to the recoil of the AR500,” commented Greg Buchel, President of Big Horn Armory. The EX Performance M4-Style Stock is a high-impact polymer, collapsible, adjustable stock. The EX Performance M4-Style Stock includes an easy-to-reach rapid adjust lever for custom length-of-pull, giving the user better trigger control and performance capabilities. It also includes an integrated QD swivel attachment and molded in non-rust sling swivel attachment for secure mounting to various sling systems. A durable polymer construction with non-slip rubber recoil pad allows for maximum recoil absorption. The oversized extra strength adjustment pin and sleek industrial design makes this the perfect addition to your carbine. “We are very happy to have been chosen by Big Horn Armory as their OEM stock provider for the AR500. Our stocks use an advanced design and high-impact, polymer construction that make this the ideal upgrade. Pairing our recoil reducing stock with the innovative AR500 is an ideal combination of performance and function,” commented Gary Cauble, VP of sales and marketing for Adaptive Tactical. Adaptive Tactical knows what their customers want and is continually striving to provide innovative, unique products for the range and at home. Interested to learn more about OEM opportunities with Adaptive Tactical? Call us at 208-442-8000. To learn more about Big Horn Armory and the advanced features of the AR500 semi-auto rifle, visit www.bighornarmory.com. For more information on Adaptive Tactical, or for dealer inquiries, visit www.adaptivetactical.com. This entry was posted in Accessories and tagged Adaptive Tactical, AR500, Big Horn Armory, EX Performance stock, stock. Bookmark the permalink.